Calgary resident and Kiwanis Club member Murray Smith has long been a supporter of CPR training for youth. The ACT Foundation recently honoured Smith, Chair of the Kiwanis Committee for the ACT High School CPR Program, with a Community Champion Award for his continuous support. In 2001, under Smith’s leadership, five Kiwanis Clubs of Calgary (Chinook, Downtown, Foothills, Northmount and Metro) helped establish the ACT High School CPR Program in the Calgary Board of Education and the Calgary Roman Catholic School Board. This was done in partnership with the ACT Foundation, Alberta Education, Calgary EMS and the STARS Foundation. Years later, after thousands of students have been trained, Smith continues to be committed to the program. 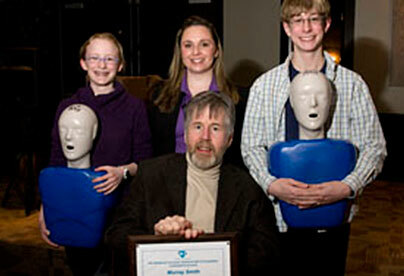 In 2007, the Kiwanis Clubs donated an additional $20,000 to replenish training mannequins for 33 Calgary high schools. Thanks to the ongoing support of the Kiwanis Clubs of Calgary, more than 65, 000 Calgary youth have been trained to save a life through the ACT High School CPR Program. The ACT High School CPR Program was made possible in Calgary thanks to generous community and provincial-level support which enabled the donation of mannequins, teacher training and curriculum resources. Community partners in Calgary are the Kiwanis Clubs of Calgary (Chinook, Downtown, Foothills, Metro and Northmount), while provincial partners of the program are Alberta Education and the STARS Foundation (a founding provincial partner in this province). Core partners supporting the program in Alberta and throughout Canada are companies in the research-based pharmaceutical industry: AstraZeneca, Bristol-Myers Squibb Canada, Pfizer Canada and sanofi-aventis. They provide ACT’s sustaining funding and are committed to the Foundation’s national goal of promoting health and empowering Canadians to save lives. The Advanced Coronary Treatment (ACT) Foundation is an award-winning, national charitable organization dedicated to establishing CPR in high schools across Canada. ACT raises funds to donate mannequins, teacher training, manuals and other materials to schools, and guides schools in program set-up and long-term sustainability. Teachers teach CPR to their students as a regular part of the curriculum. More than 900,000 youth have been trained in CPR through this lifesaving program to date.